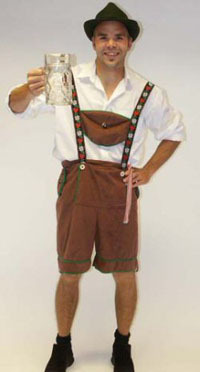 An Austrian designer is taking orders for personalized luxury lederhosen. Would you like some diamond-studded pair for EUR84,000 (US$114,000). Wohlmuther, who works with a local jeweler in the Styrian town of Liezen, said his first pair of luxury lederhosen - decorated with 166 diamonds - went to a German buyer who lives in Dubai, United Arab Emirates, earlier this summer. He said he hopes to attract more interest from that region, as well as from Russia.